It is Wednesday and you all know what that means. get a handle on my sewing chaos. Keyword...try. First there was March's FNSI. I spent all day sewing, sewing, and sewing. 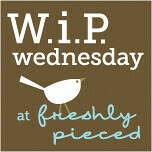 In fact I finished piecing a top and whipped a pieced back together. And then I followed it up with even more sewing the next day. On Saturday I packed up my sewing machine and a few projects, road tripped with my mom and little sister (and their sewing machines and projects) to my grandma's house. We arrived to the smell of brownies and banana bread baking in the oven. Aren't grandmas the best? Then in a matter of ten minutes we had four sewing stations, two cutting stations, and one ironing station all set up and ready to roll. And the rest was history. grandma's sewing station on the left and mine on the right. It was such a wonderful day! I am crossing my fingers that there will be many more 3 generation sewing days in the very near future. mom's on the left. sister's on the right. notice the caffeine and chocolate. the key to any sewing day! Solids Film Strip Quilt Top. I am really itching to get back at this one. There is only a few more weeks left and I have just a bit to go. do. Good Stitches -- March block. Oh, I'm so jealous of your sewing time with your family. My mom and grandmom are many states away. Maybe we could sew together over Skype! hee hee! Cherish that time, it's wonderful. And kudos to you - your numbers are nice and low! Good job keeping it under control. (maybe you should join the new bee with me?) -yeah,I'm an enabler like that. Awww! So sweet! My mom and I occasionally have sewing days, but 3 generations - that is awesome! You are so lucky. 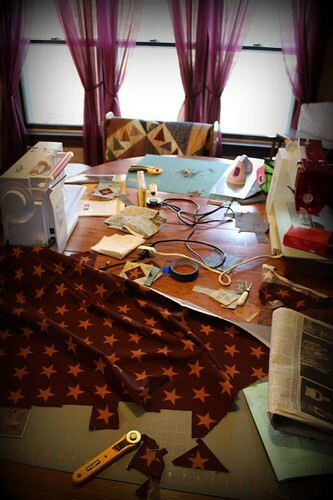 That is so awesome that your whole family sews, and you get to have generation sewing days!! My mom has dabbled in sewing, but nothing consistent and certainly doesnt sew or quilt now! So so much fun. What a great time sewing with your sisters,mom & grandmother! My Grandmother taught me to sew and I have great memories of sewing with her, but my mom is a tad more meticulous than I am and my sister and I in the same room with sissors would not be good. That was some serious sewing going on! I am jealous! oh, how sweet. 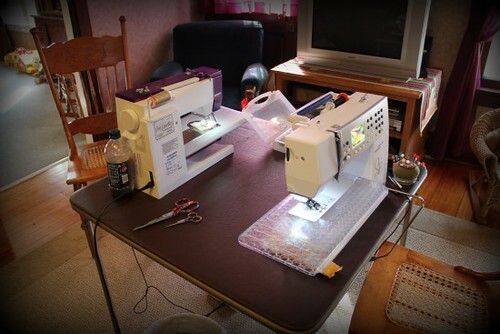 your post is making me wish there were space in my house to set up stations like that to do a sewing day with my mom and mother-in-law. I hope this becomes a tradition! How fun.